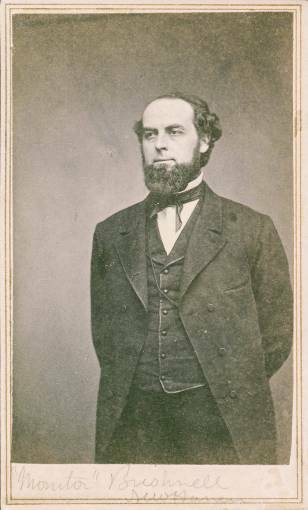 Cornelius Scranton Bushnell was a 19th-century Connecticut businessman and shipbuilder whose successful lobbying efforts on behalf of a local railroad enterprise caught the attention of prominent members of Abraham Lincoln’s administration. Bushnell then used his political connections to obtain government contracts to build ships. Among his designs was perhaps the most famous fighting vessel of the US Civil War, the USS Monitor. Bushnell was born in Madison on July 18, 1829. He attended school in Madison before shipping out at age 15 to begin a career at sea. After 5 years of commercial voyages he returned to Connecticut, married, and purchased a home in New Haven. There he entered into a partnership with his brother to sell marine hardware and the business proved wildly successful. In 1858, Bushnell took an interest in the nearly bankrupt New Haven and New London Railroad. After overseeing 2 years of renovations that made the line profitable, Bushnell became president of the railroad. During this time, he traveled to Washington, DC, where he lobbied for legislation to protect his small railroad from its over-sized competitors. In addition, Bushnell managed to obtain contracts from the US Postal Service to carry mail. With the outbreak of the Civil War, President Abraham Lincoln asked his Secretary of the Navy, Gideon Welles, to establish a naval blockade around the Confederate states. Having witnessed the proficient manner in which Cornelius Bushnell lobbied DC politicians on behalf of his railroad, Welles asked Bushnell to present a bill to Congress requesting funding for the construction of ironclad ships. Bushnell won Congressional support for the bill and Welles immediately published an advertisement soliciting designs from potential shipbuilders. The navy approved three designs for construction, one submitted by Bushnell (now the operator of a shipyard in the Fair Haven section of New Haven). 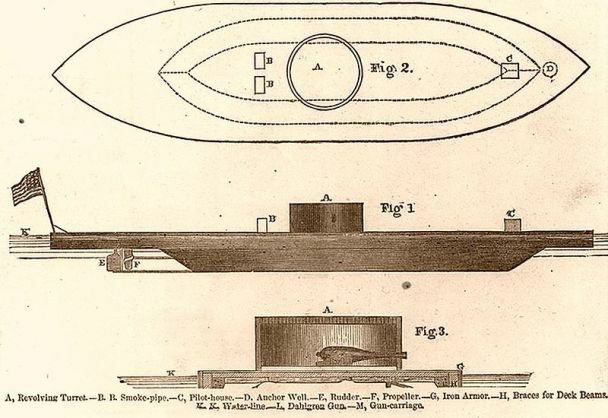 Bushnell’s ship, the design of which he obtained after a meeting with its architect, Captain John Ericsson, eventually became the ironclad USS Monitor. Constructed during the fall and early winter of 1861 and 1862, the Monitor went on to defeat the Confederate frigate CSS Merrimac in perhaps the most famous naval battle of the Civil War. After the war, Bushnell looked to expand railroad service to the Pacific through the formation of what ultimately became the Western Pacific Railroad, but a financial panic in 1873 caused him to lose a significant portion of his investment. Bushnell spent the last 10 years of his life in quiet retirement as a resident of New York City. He passed away in New York in 1896. His family had him buried in New Haven and the citizens of that city dedicated a memorial to him in 1906 that still stands along Derby Avenue today. “Cornelius S. Bushnell Biography.” Madison Historical Society, 2017. Link. Wells, William S., Cornelius S. Bushnell, John Ericsson, and Gideon Welles. The Original United States Warship “Monitor.”: Copies of Correspondence Between the Late Cornelius S. Bushnell, Captain John Ericsson and Hon. Gideon Welles. Together with a Brief Sketch of Mr. Bushnell’s Life ... Records Showing How the Plans of the Monitor Were Urged Upon the Government and Finally Adopted. New Haven, CT: Cornelius S. Bushnell National Memorial Association, 1899. Link.